Big brother is big business in the battle against crime in Britain, but photo-shy villains have developed a bag of new tricks to elude the gaze of thousands of surveillance cameras that now dot its cities, towns and villages. With 1.5 million closed-circuit television systems watching its streets, office buildings, schools, shopping centers and roads, Britain is one of the most closely monitored nations on the planet, and the government is spending another $115 million for more TV eyes. But crime is soaring across the country. In London, a city of 8 million people, murder is going on at a record pace. Street robbery, the very crime that CCTV is supposed to be best at deterring, will reach 50,000 this year. The problem, one exasperated police source told United Press International, is that "the TV cameras can't be everywhere. There are hundreds of thousands of nooks and crannies left, everywhere you look, and this is where criminals are increasingly operating. And when a camera shows up, they move elsewhere." Many of the villains are adapting. Some are targeting luxury cars on the move so that any view a TV camera gets of them is fleeting at best. Others conceal their street muggings by grabbing their victims in a clinch that, on CCTV, looks like nothing more than a romantic hug. Police say criminals discouraged by the prospect of an unwanted TV appearance in London or other cities take to commuting to the countryside where prospective victims are more trusting and the pickings are easier. "There is more security-consciousness now in urban areas, which makes it less easy for the thief, than in the countryside where, generally speaking, people have tended to be more lax," said Nicholas Bond, a spokesman for NFU Mutual, an insurance company specializing in rural communities. "There is a feeling that opportunist crime is moving out toward the rural areas," said Ian Fraser of CGNU, one of Britain's largest household contents insurers. The British government is convinced that TV surveillance will remain a major anti-crime weapon and recently announced that it is financing the installation of more than 200 closed-circuit monitoring systems, from London to provincial cities and towns. "CCTV has repeatedly proved its effectiveness in the fight against crime and the fear of crime," said John Denham, a minister in the Home Office. "Knowing that there is an extra set of eyes watching over their communities helps to reassure people that they will be safe." Experts are convinced that more advanced technology is making CCTV an even more valuable tool. In the city of Hull, for instance, a test project in one crime-ridden area is based on a new, Internet-based CCTV system using tiny cameras disguised in street lamps or concealed on buildings to transmit digital pictures to a monitoring center around the clock. Authorities said an independent evaluation of the system showed that in the first five months of operation, car crime in the area was down 80 percent, shoplifting was down 69 percent, robbery was down 68 percent, burglary was down 49 percent and violent crime is down 30 percent. "As the system is digital," said project manager John Marshall, "there are no video tapes, and images are transferred instantly from camera to computer, where the data can be transferred to police stations by the Internet." Other local governments are interested in the idea, but cost could become a major deterrent. The system in the Hull trial cost an estimated $570,000 for protection of 3,200 residents. Meanwhile, other areas are reporting less-than-spectacular success with big brother technology. In London's Newham district, 300 cameras are dotted around the central business area yet street robberies increased by one-fifth in 2001 from the previous year, and car thefts climbed by 3.6 percent. "Although CCTV cameras might be useful within a broadly based anti-crime strategy," said one specialist, "turning the nation's city and town streets into seamless surveillance zones is itself no substitute for proper policing." A three-year study commissioned by the British government and conducted by the Scottish Center for Criminology suggested that "spy" cameras had little or no effect on crime. It concluded that "reductions were noted in certain categories, but there was no evidence to suggest that the cameras had reduced crime overall." "The cameras appeared to have little effect on clear-up rates for crimes and offenses" the report said. The findings "have taken the stardust out of our eyes about this new technology," said Jason Dittion, a criminologist and the study's main author. CCTV's defenders point out that it was such technology that recorded the abduction of 2-year-old James Bulger in a Liverpool shopping center by a pair of 10-year-old boys who later bludgeoned him to death. The TV evidence was key to their arrest and conviction. At the other end of the scale, police forces across the land are using surveillance cameras to "capture" and convict thousands of speeders and other traffic violators -- and the local government in Merton, in south London, is using its 60 CCTV surveillance cameras to zero in on litterbugs. The use of surveillance cameras in policing has, perhaps inevitably, attracted frowns from civil liberties groups, who see them as an infringement on individual rights. "I don't think anyone has really thought through the implications of all this," said Simon Davies, of the civil rights watchdog group Privacy International. "What tends to happen is you start penalizing extreme or unusual behavior, which leads to social exclusion," Davies said. "And it won't be just criminals. A safer and more efficient Britain is not necessarily a better society." The police see life under the camera's view somewhat differently. "When cameras are properly targeted," said Graeme Gerrard, a spokesman for the Association of Chief Police Officers, "they can deter offenders, reduce the level of crime and increase the feeling of safety for those using our public spaces." The surveillance camera as a public amenity is here to stay, but the arguments about usefulness, legality and ethicality have only just begun. With former U.S. President Bill Clinton's encouragement, his half-brother, Roger, collected hundreds of thousands of dollars to lobby on behalf of as many as 13 people seeking presidential pardons and other favors, a key congressional panel has found. This characterization goes far beyond what Roger Clinton has acknowledged about his activities in seeking presidential pardons and suggests that he was much more deeply involved than previously known. The new revelations about the Clinton brothers are contained in the final report by the House Government Reform Committee, which for the last year has been investigating the pardon scandals. The report was obtained March 12 by The Los Angeles Times. The probe concluded that the former president and his administration repeatedly failed to properly check the backgrounds of people seeking pardons and sentence commutations. It also said the Clinton White House permitted a culture that provided easy opportunities for relatives and close associates of the president to make money on the side by lobbying for clemency and other presidential favors for convicted felons. "Bill Clinton made some very bad decisions when he gave away pardons," said one official close to the committee's investigation. "His administration very seldom did real background checks on many of those seeking pardon." Bill Clinton has denied that pardons were for sale. The House committee is headed by Rep. Dan Burton (R-Ind. ), a longtime Clinton adversary. Clinton White House officials have decried the review as nothing more than a partisan attempt to hound the Clinton administration long after it has left the White House. The panel's report also provides new details about the prison commutation granted to convicted cocaine dealer Carlos Vignali of Los Angeles. Congressional investigators found that the president's brother-in-law Hugh Rodham repeatedly misled the White House in seeking a commutation for Vignali and suggested that former First Lady Hillary Rodham Clinton was also behind the commutation. In addition, investigators have concluded that Rodham, despite his public statements to the contrary, has returned less than one-fourth of the $204,000 fee that he said he had given back to the Vignali family. The committee also determined that President Clinton granted a pardon to fugitive financier Marc Rich only after his sponsor, former White House Counsel Jack Quinn, went around the Justice Department. Quinn apparently did so on the advice of then-Deputy Atty. Gen. Eric H. Holder Jr., who was hoping to be elevated to attorney general if Al Gore was elected president, the report found. For instance, the committee said it found one e-mail from Holder to Quinn, written during the 2000 presidential recount, telling him to "go straight to wh [White House]" and that the "time is good" for a Rich pardon. Holder has said that he learned of the Rich pardon just as Clinton was about to leave office and had hoped that prosecutors in New York, where Rich was convicted, were being allowed to give their recommendation against the pardon. While strongly suggesting that laws were broken and that more FBI and Justice Department investigation is needed, the committee stopped short of alleging criminal wrongdoing. However, the panel did note that a federal grand jury in New York has been investigating the scandal for a year, implying that criminal charges could eventually result. Roger Clinton, in an interview last year with The Times, insisted that he asked his brother to pardon only six of his closest friends, none of whom received pardons, and that he never asked for or received compensation for those efforts. But the House committee has found a completely different picture. "Roger Clinton engaged in a systematic effort to trade on his brother's name," the report said, and that most of those efforts involved pardons. "President Clinton encouraged Roger Clinton to capitalize on their relationship," the report said. "At the beginning of his second term, President Clinton instructed Roger Clinton to use his connections to the administration to gain financial advantage." 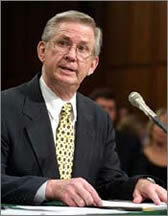 The report quotes George Locke, a former Arkansas state senator and close associate of Roger Clinton, as saying "that Bill Clinton had instructed him that since this was his last term in office, Roger should find a way to make a living and use his relationship with the president to his advantage." Locke has refused to publicly discuss his relationship with the Clintons after the pardon scandal. The committee describes Roger Clinton as so eager to make money from pardons that he even approached Rita Lavelle, a former Reagan administration Environmental Protection Agency official. Lavelle had been convicted of perjury in the 1980s, and she told the committee that she was approached by a Roger Clinton intermediary who asked for $30,000 for Roger to hand-carry her pardon petition to the president. She said she could not afford to pay that, but that Roger "agreed to deliver the petition anyway." Then, on the last night of the Clinton presidency, Roger asked her, "Do you have $100,000 to get this through?" Being bankrupt, she laughed and said no. Her pardon request was not granted. In the Vignali case, the committee found that Hugh Rodham repeatedly "provided false and misleading information" to the White House about the Los Angeles man's criminal history and advised the administration that the commutation for Vignali was "very important" to his sister, then-First Lady Hillary Rodham Clinton. Now-Sen. Clinton (D-N.Y.) has denied any knowledge of her brother's work on behalf of Vignali. The report adds that Hugh Rodman repaid only $50,000 of his $204,000 fee from the Vignali family and "has no plans to return the remaining $154,000." Hugh Rodham has repeatedly refused to discuss his work on behalf of the Vignalis. Holder, the deputy attorney general in the Clinton White House, has denied that his desire to be attorney general had anything to do with his involvement in the Rich pardon. But, the report says, this incentive "provides a much clearer and more believable motivation than any offered by Holder to date." The report also explores Roger Clinton's relationships with foreign governments. It says Roger received "substantial sums of money" from foreign governments and that he tried to pass some of the money on to his brother, only to be repeatedly told the president could not accept it. Roger Clinton received at least $335,000 in "unexplained" blank travelers' checks from Taiwan, South Korea and Venezuela, the report says, and he also was paid $30,000 by a company to lobby his brother to loosen U.S. restrictions on travel to Cuba. The committee said Roger "participated in a plot to obtain a $35,000-per-month contract" from an Alabama airport promoter in exchange for urging then-Transportation Secretary Rodney Slater to speak at a company gathering. The report also describes other Roger Clinton ventures, such as his previously reported receipt of $50,000 from an alleged organized crime family to win clemency for convicted drug dealer Rosario Gambino and a "substantial portion" of $225,000 put up by a Texas family to help Garland Lincecum be released from prison on fraud charges. Chinese President Jiang Zemin last week asked the armed forces to make "solid preparation for military struggle" in order to attain national reunification. While addressing military delegates to the National People's Congress on March 13, Jiang said: "to solve the issue of Taiwan and realize complete reunification of the motherland is one of the three major tasks for the Party and the nation in the new century." However, Jiang, who is also Chairman of the policy-setting Central Military Commission (CMC), did not lay down specific tactics or a definite time-frame for taking back Taiwan. Sources close to the People's Liberation Army (PLA) said Jiang was using harsher than usual rhetoric on Taiwan partly in response to recent events between Taiwan and the United States. They included a visit to the U.S. by Taiwan Defense Minister Tang Yao-ming and American arms sale to the island. "Jiang is facing more pressure particularly from mid-ranking PLA officers to be tougher with Taiwan and the U.S.," said an army source. "Jiang's response is that the nation must focus on economic development. He is, however, willing to satisfy the generals' demand for bigger budgets." In his speech to the PLA delegates, Jiang stressed the importance of a hi-tech army -- and the need to take advantage of China's entry to the World Trade Organization to learn more about the armies of Western countries. The president, however, underscored the imperative of the party's strict control of the PLA. Analysts say Jiang has doubts whether his heir-apparent, Vice-President Hu Jintao, may be able to fully control the top brass once he becomes party general secretary, and later, CMC chairman. At the session, the president also called upon the PLA to assume more responsibilities in fighting anti-terrorist activities, primarily in regions with concentrations of ethnic minorities -- and underground separatist groups. "The army should help local governments in combating all forms of terrorist activities," the Liberation Army Daily on Wednesday quoted Jiang as saying. Analysts say the bulk of anti-terrorist tasks are being handled by the quasi-military People's Armed Police. They say the fact that Jiang is calling on the army to join in the campaign means Beijing is anxious to achieve early results in containing separatist movements in Xinjiang and Tibet. Handing President Bush his first defeat of a judicial nominee, Democrats led a 10-9 party-line Senate Judiciary Committee vote opposing the confirmation of District Court Judge Charles Pickering to the 5th Circuit Court of Appeals. In a series of roll calls, the panel also snubbed Bush's request to allow a vote in the full Senate on Pickering, a 64-year-old Mississippian with more than a decade on the bench. Pickering "deserves better than to be blocked by a party-line vote of ten senators on one committee," Bush said in a statement issued moments after the panel voted. "The voice of the entire Senate deserves to be heard." There was little suspense about the committee's vote, but no shortage of emotion in the four-hour debate. Pickering does not have "the temperament, the moderation or the commitment to core constitutional ... protections that is required for a life tenure position" on the appeals court, said Sen. Edward M. Kennedy, one of an unbroken string of committee Democrats to argue against confirmation. Republicans were equally united in their support of Pickering. Sen. Orrin Hatch, R-Utah, argued that Bush's nominee had been victimized by a smear campaign by liberal interest groups seeking to impose "an ideological litmus test" on abortion, civil rights and other issues. The committee's actions left the nomination all but dead. The GOP leader, Sen. Trent Lott  Pickering's friend and Mississippi patron  has authority to seek a vote by the full Senate, but such efforts are customarily settled on party-line votes. Even so, Lott quickly went to the Senate floor, where he defended his friend of 40 years. "I take it personally," he said of the vote, which he also labeled a "slap at Mississippi." One Democrat, Sen. Zell Miller of Georgia, attacked the committee. "This action may very well elect a Republican governor in Mississippi," he said, calling Pickering's rejection an example of "the Terry-tail wagging the Democratic donkey." That was a reference to Terry McAuliffe, the party's chairman. Supporters and opponents of Pickering's confirmation filled the large committee room. Supporters wore pink badges that said "Stop the Bickering Confirm Pickering." The debate, which stretched over more than four hours, ranged far from Pickering's case. Republicans noted  with dissatisfaction  numerous public predictions that the confirmation battle was a warm-up for any Supreme Court nominations that Bush might make. Democrats repeatedly accused Republicans of mistreating many of the nominations made by former President Clinton, to the point of denying hearings for months at a time. Pickering was not present, but his son, Rep. Charles Pickering, R-Miss., had a seat in the front row of the spectators section. "What is happening to your father today is a great injustice," said Sen. Mitch McConnell, R-Ky., addressing his remarks to the young congressman. Bush made a few late calls on behalf of his beleaguered nominee in the run-up to the committee meeting, but there was no indication that Democrats were wavering in their plan to deny Pickering a floor vote. Senate Majority Leader Tom Daschle told reporters the president was "asking us to break a 200-year tradition" of Senate committees holding jurisdiction and responsibility for approving nominations. "I don't know that we can do that," he said. "By failing to allow full Senate votes on judicial nominees, a few senators are standing in the way of justice," Bush had said. Democrats "seek to undermine the nominations of candidates who agree with my philosophy that judges should interpret the law and not try to make law from the bench," the president said at his news conference a little less than 24 hours before the committee met. The debate on March 14 unfolded along party lines, and it seemed at times as though there were two nominees up for confirmation. The committee chairman, Patrick Leahy, said Pickering "repeatedly injects his own opinions into his decisions on issues ranging from employment discrimination to voting rights." Other Democrats referred to a case in which Pickering had sought a lighter sentence for a defendant on a cross-burning case  a case that Republicans said was misinterpreted by the judge's critics. Democrats said Pickering's ruling in voting rights cases had been overturned by the appeals court. Republicans countered the reversal had to do with attorney fees, not the merits of the case. Sen. Charles Grassley, R-Iowa, praised Pickering for "moral courage on the issue of race," demonstrated in 1967 when he testified against a Ku Klux Klan leader in Mississippi. Much of the opposition to Pickering, 64, has come from civil rights groups, which say he supported segregation as a young man in Mississippi. Pickering's opponents also point to his conservative voting record as a Mississippi state lawmaker and decisions as a judge. Supporters, including some Mississippi Democrats and black leaders, cite numerous examples of support for civil rights as far back as the middle 1960s and note that Pickering won Senate confirmation in 1990 to be a U.S. District Court judge. Forty of the 92 Bush judicial nominations have been confirmed by the Senate, most of them District court judges. Seven of Bush's 29 nominees to the U.S. Appeals Court, the regional courts one step below the Supreme Court, have been confirmed. Osama bin Laden's al-Qaida network has stepped up its financial activity markedly in recent weeks, suggesting some leaders are reasserting control and may be seeking to finance more attacks against American interests, a U.S. official says. The communications, detected by U.S. intelligence, have occurred between small groups of al-Qaida fighters and some Taliban allies, officials said. Much of the activity is centered in northwestern Pakistan  near the Afghan border  although some money and communications are going elsewhere, one official said. "There's lots of signs al-Qaida is reconstituting itself," said Vince Cannistraro, a former CIA counterterrorist chief. "Internet traffic has picked up enormously. Money is moving around. There is some evidence leadership is active." The fate of many of al-Qaida's top commanders is unknown. While several have been killed in the Afghan war, and a few captured, many are believed to have hidden in caves in Afghanistan to wait out the U.S. bombing campaign. President Bush recently called him "marginalized," and intelligence officials, during classified briefings to congressional leaders, suggested he had been wounded and may be quietly recovering somewhere. But they acknowledge there is no hard evidence on his condition. On March 15, a top Treasury Department official said more than 150 countries have joined the United States in helping to freeze accounts and block transactions between suspected terrorists -- including al-Qaida operatives. Al-Qaida's money is believed to come from a number of sources  bin Laden's personal fortune, donations of seemingly legitimate Islamic humanitarian concerns, and honey and gold trading. Four top officials of the Immigration and Naturalization Service were replaced March 15 amid a firestorm over the agency's letters confirming student visas for two of the September 11 hijackers. Justice Department officials told CNN that changes were already planned at INS, but they acknowledged the government's frustration and embarrassment over what one aide termed "the debacle" had hastened the personnel moves. INS Commissioner James Ziglar, who some key lawmakers criticized last week, officially announced that the executives were being shifted to other positions. In a written statement announcing the changes, Ziglar said, "The breakdown in communication highlighted by this week's events at INS is unacceptable and will not be allowed." The agency drew criticism from all directions when Huffman Aviation, a Florida flight school, disclosed it had received letters March 12 from the INS confirming the approval of student visas for terrorist hijackers Mohamed Atta and Marwan Al-Shehhi. Authorities say Atta and Al-Shehhi piloted the jetliners that crashed into the World Trade Center's twin towers six months ago. At a news conference March 13, Bush said he was stunned and "plenty hot" when he read about the matter. "The INS needs to be reformed, and it's one of the reasons why I called for the separation of the paperwork side of the INS from the enforcement side," he said. "And obviously, the paperwork side needs a lot of work. It's inexcusable." Attorney General John Ashcroft, meanwhile, asked leaders on Capitol Hill for the authority to fire INS officials -- a power that had been dropped during the appropriations process. "It is essential that I have the authority to quickly discipline or terminate individuals for acts of negligence, mismanagement or disregard for Department of Justice policies," Ashcroft said in letters to House and Senate committees. Ziglar maintains the confidence of the attorney general, Justice officials said. Justice and INS officials said some of the replaced managers may have been involved in overseeing the process that resulted in the letters being mailed. Career Justice and INS employees considered to be stronger managers were named to replace other career employees, one official said. The announcement said Renee Harris, the deputy chief of the Border Patrol, is being moved into the post of acting director for international affairs. In addition, Johnny Williams, who heads the INS Western Region, was named executive associate commissioner overseeing all INS field operations. Justice Department veteran Janice Sposato and INS manager Michael Cronin were also named to top posts. "We know there are longer term, broader situations that need to be dealt with, but this is to address the immediate short-term problem," a Justice Department official said. Chinese Vice Foreign Minister Li Zhaoxing has summoned the U.S. ambassador to express Beijing's "strong indignation and resolute opposition" to what it perceives as growing American support for Taiwan. Beijing considers Taiwan a breakaway province and regards any outside influence on the island's status as interference in its domestic affairs. State-run CCTV, Xinhua and most Chinese papers reported the story prominently March 17. That the strongly worded diplomatic protest was made on a weekend and was widely reported by the Chinese media may have been meant to amplify Beijing's anger. "The era of Chinese being bullied is long past," Li was quoted as telling Ambassador Clark Randt, adding: "In the world today, it is a very proud thing to be a Chinese." Li criticized Washington for permitting Taiwan's defense minister, Tang Yiau-ming, to attend a defense convention this month in Florida. The visit was the first by a defense minister from Taipei since 1979 when Washington officially switched diplomatic ties to Beijing. Li also protested the planned visit to the U.S. by former Taiwan President Lee Teng-hui. Lee has been labeled a "trouble-maker" by Beijing's for his pro-independence efforts during his time in office. By pampering such figures, Xinhua quoted Li as saying, the U.S. was "inflating the arrogance of the separatist forces in Taiwan." He said the question of Taiwan was "the most important and most sensitive issue at the heart of China-US relations", adding: "Pampering and supporting 'Taiwan independence' can only meet with the resolute opposition of all the Chinese people and will be doomed to failure." Chinese officials have also reacted angrily to reports recently about a Pentagon contingency plan to use nuclear weapons against China in certain situations, which might include a conflict in the Taiwan Strait. Accusing the U.S. of "nuclear sabre-rattling" Li said China was no threat to the United States and stood by its call for the elimination of all nuclear weapons. "If there is anything good in threatening the Chinese people, it can only be one thing: the Chinese people's vigilance against certain people will be further heightened, their determination to safeguard the motherland's sovereignty, territorial integrity and national dignity will be greatly enhanced," he was quoted as saying. Foreign Ministry spokesman Sun Yuxi said China was "deeply shocked" at reports that China was on a Pentagon nuclear hit list and called on the Bush administration to explain what the weapons review meant for U.S. policy. China was among seven countries listed on the Pentagon "Nuclear Posture Review" list of potential targets, including Russia, Syria, Libya as well as the three states President Bush has labeled as forming an "axis of evil": North Korea, Iran and Iraq. "In just over one month, the American side has committed a series of bad actions that trample upon the spirit of 'U.N. Convention' and the three Sino-U.S. communiqués," the Xinhua report said. As a result the agency said China sees a pattern in Washington's approach to relations, prompting the weekend summons and diplomatic protest. The three Sino-U.S. communiqués are regarded as the founding guidelines for relations between Washington and Beijing, particularly with regard to the status of Taiwan and what Beijing calls the "one China" principle. A U.S. State Department spokesman said the Bush administration had no comment on the Chinese complaints. Ambassador Randt agreed to convey China's protest fully to the highest officials, Xinhua reported. Portugal's Social Democratic Party drove the Socialists from power in elections on March 17 as voters swung to the right and gave conservative parties a majority in parliament for the first time in seven years. The Social Democrats have pledged to cut corporate taxes, slash public spending and sell off some state companies in an effort to revive Portugal's faltering economy. However, their narrow margin of victory meant they may have to negotiate terms for a coalition with the rightist Popular Party -- the third highest vote-getter -- in order to push laws through parliament. The parties' past attempts to form an alliance have failed due to feuding between their leaders. Social Democrat leader Jose Durao Barroso, who is to be the new prime minister, said the Portuguese had expressed "a desire for change" after the Socialists "led Portugal into extreme difficulties." "A new era has begun today. I hope it will bring a richer and fairer country," he said. The Social Democrats collected 40.12 percent of the vote compared to 37.85 percent for the center-left Socialists. The Popular Party, which opposes immigration and abortion, netted 8.75 percent. The Social Democrats gained 102 seats in parliament and the Popular Party gathered 14, providing them together with a slim majority in the 230-seat Parliament. The Socialist Party -- which won the last general, presidential and European ballots and governed for the past six years -- was on the defensive after it lost heavily in December's municipal elections and resigned from government, but it achieved a face-saving result. "We lost, but we lost honorably," Socialist leader Eduardo Ferro Rodrigues said. He pledged to fight any Social Democrat attempt to reduce welfare rights. Most votes should be counted by March 18, though the final official result will not be known until March 27 after postal ballots from voters abroad have been counted. Those votes represent four seats and are traditionally split between the two main parties. Portugal's shift to the right mirrored a trend in other European Union countries with conservative parties coming to power last year in Italy and Denmark. Following the top three parties in the vote, the Communist Party had roughly 7 percent and the communist Left Bloc had around 2 percent. Smaller parties and spoiled ballots accounted for the rest. The turnout was about 60 percent of the country's 8.5 million registered voters. The international economic slowdown has exposed fundamental flaws in Portugal's economy, bringing concern that the country has squandered EU development aid amounting to $26.4 billion since 1989. That aid will start drying up in four years' time. Productivity per worker is still the lowest in the European Union and lower than in Slovenia, Hungary or the Czech Republic. Education standards also remain the lowest in the 15-nation EU. The Lausanne, Switzerland-based Institute for Management Development last year described Portugal as the least attractive EU country for investment. Popular Party leader Paulo Portas said: "Portugal is backward. It needs justice, efficiency, discipline." Under the free-spending Socialists, the public sector became bloated. They added 60,000 state employees, taking the number over 700,000, or about 15 percent of the country's workforce. Their salaries soak up about 12 percent of the country's wealth, government figures say. Even so, the quality of public services has deteriorated. The courts have huge backlogs of cases, most hospitals are overcrowded, and long queues to obtain documents are common at public offices. The new government is expected to take office in mid-April.